Tsumi is a rather strange individual. He is very sarcastic, while kind at the same time. Tsumi has a very strong sense of right and wrong, and intervenes into the simplest of conflicts. Tsumi does not understand his own mortality, and would gladly sacrifice himself for a good cause. He is a naturally brave soul, with one exception, GIRLS. Cannot talk to anything female, and usually gets a bit nervous when a girl talks to him. He knows nothing about romance so, when the topic is brought up, he becomes quiet. Tsumi can usually withstand a girl’s presence once he gets to know them enough. Very sentimental about his life, but doesn’t really like to talk about it. Tsumi finds new motivation every time someone shows that they have genuine faith in him. Tsumi enjoys being social and talking to others. Tsumi doesn’t work well in a group he doesn’t know, but easily coordinates once he actually knows them. A clear head is the key to any win, and that’s exactly what Tsumi tells himself during every fight. Tsumi will give anything to protect his sister, Shinrai. She is the only person that Tsumi can really share his feelings with. Tsumi would give anything to shield her from harm, even if it meant his own life. Tsumi does, however, tend to be overprotective of his dear sister and does not let anyone he doesn’t know near her. Tsumi has been trying for a while to learn how to cook, and always fails miserably. Shinrai, being incredibly kind, always chokes down every bite of Tsumi’s pathetic cooking. In short, the bond between Tsumi and his sister is unbreakable. Even across the bands of death, one would live on in the other’s heart. Tsumi weighs in at 120 pounds, standing at an even 6 feet. Tsumi, due to the serum injection, has eyes that change color, depending on his mood. Red means anger, blue means sad and so on (all eye color emotions will be explained as they are used). Tsumi has never bothered to smooth down his white hair, and as a result, it sticks out in many places. Tsumi's hair is mostly short, but two strands in front go down to his mouth. Some infant beard hair grows upon Tsumi’s chin, but he has never noticed. Tsumi has a rather scrawny build and, much to his dismay, can’t seem to gain weight, no matter how much he eats. The item around his neck is a necklace, which his sister made for him. She told him to only open it when she dies, and he has kept this promise nicely. 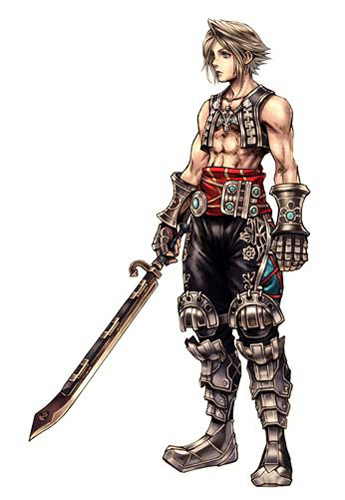 On his chest is a metal vest, which offers minor protection to Tsumi. Now, Tsumi's vest is made of steel, using very small chain links in some places, so that the wearer can still move comfortably and easily. On his legs are his pants, which are also plated with metal. In fact, his pants are made of three layers: Cotton on the inside, for easy mobility; Leather on the outside, for minor protection; And Overlapping plates on his lower legs, for shielding. Tsumi never leaves the house without his metal gloves (he likes metal about as much as he likes swords).